Show Me The Movies: Review: Game Night - Entertaining, absurd dark and satisfying action comedy - but not a game changer! Review: Game Night - Entertaining, absurd dark and satisfying action comedy - but not a game changer! After a few intense weeks of Oscar hype, excitement, anticipation and in some cases disappointment (how Three Billboards Outside Ebbing Missouri lost out to the Shape of Water for Best Picture is something I may never understand!) it was nice to settle in this week for an old fashioned caper comedy guaranteeing over ninety minutes of pure cinematic escapism! 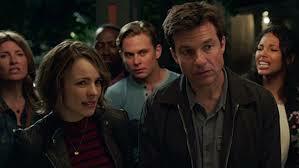 In Game Night, Jason Bateman and Rachel McAdams star as Max and Annie, whose weekly couples game night gets kicked up a notch when Max's charismatic brother, Brooks (Kyle Chandler), arranges a murder mystery party, complete with fake thugs and imitation federal agents. Things take a turn for the worse when Brooks gets kidnapped, and all is not as it seems! Directed by Horrible Bosses writing duo John Francis Daley and Jonathan Goldstein, Game Night sees a return to the screwball action comedy that was a staple diet of cinema audiences of the 80's. This feature works largely due to it's sharp script, plenty of impressive action sequences and an ensemble cast that manage to paper over the farcical plot cracks with some fine performances. Jason Bateman (back on familiar ground after his superb transition to drama in Netflix's Ozark), you feel could play his part in this film in his sleep such is his natural charisma for roles like this. Rachel McAdams also seamlessly fits the role of Annie and the on screen chemistry between the two leads is obvious and one of the main reasons that this film works. The supporting cast is full of comedic quality with Sharon Horgan, Lamorne Morris and Billy Magnussen all adding their considerable talents to the production but it is undoubtedly Jesse Plemons as creepy neighbour Gary that steals the show in a role that he completely makes his own. There are some downfalls to Game Night however with the premise of the film itself at times beyond far fetched and it could be argued that this is yet another patchy comedy about suburbanites getting dragged into a dodgy crime caper - a plot theme that hasn't really worked previously (Date Night, Keeping Up with the Jones etc) but does fare slightly better here. Ultimately though, whilst this may not be a film that will live long in the memory it does contain enough laughs, thrills and fun to label it an enjoyable and entertaining film - just not a game changer!